One of my mentors, Alan Weiss (author of Million Dollar Consultant) preaches that life is about success, not perfection. As lawyers, we are taught to think in terms of perfection. Yet I think of my own lawyer, with whom I have long been satisfied. His staff may produce documents that I think are less than perfect, technically and substantively. My lawyer, however, always goes to the heart of the matter and is focused on achieving my objectives, regardless of the legal niceties of the situation. 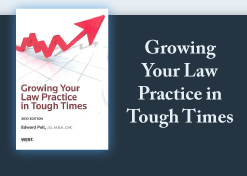 Some months ago, I heard Ari Kaplan speak to the ABA's Law Practice Management Section's LegalTech Show in Chicago. He said that marketing is about momentum, not perfection. His reasoning was that effective marketing requires being authentic, showing your own persona through your efforts. Speed and frequency of your efforts are the keys to marketing, according to Kaplan, not perfection. One specific tactic he suggested that resonated with me because of my extensive travels is that you should contact the press in the areas where you travel. Send them an email or pick up the phone and call them; tell them you'll be in the area on such and such a date; and that you'd enjoy talking or meeting with them should they desire. That's how Kaplan has gotten quoted in papers all over the country. A simple, yet very effective, technique. And Alan Weiss goes further by talking about "marketing gravity." This means having enough material in varying media that you become perceived as a thought leader in your field. In other words, write articles for local and national publications in your field; write a commercially published book (the gold standard of marketing success) for the equivalent of third party endorsement (only someone important would appear in a commercial publisher's venue); speak at conferences; create teleseminars; create a video; do podcasts; refine and improve your website; send out an electronic newsletter. These are only a few of the channels of communication. The channel of ideas distribution is not magic; you must be all over because you never know from whence that phone call to engage you will come. Lawyers too often find marketing daunting because there are so many potential clients, so little time to reach them and so many options for pursuing them. The message here is that there is no one tactic to cover all communication opportunities with your marketplace. Trying too hard for the perfect marketing approach may keep you from doing any marketing at all. Invitation to Breakfast: September 16, 2010 at 7:30 a.m., I invite those who are members of our community and are in the Las Vegas area to join me for breakfast. If you are a subscriber to LawBiz® Tips, a member of LawBiz® Forum, a reader of LawBiz® Blog or part of my coaching program, let me know if you're in the area on Sept 16th and want to join us for breakfast. We'll meet, network with others in the area and talk about the opportunities and challenges you are facing in your practice. Informal. Please R.S.V.P. by September 12th. I'll respond directly to those who respond with the location of the restaurant. I look forward to seeing you there.